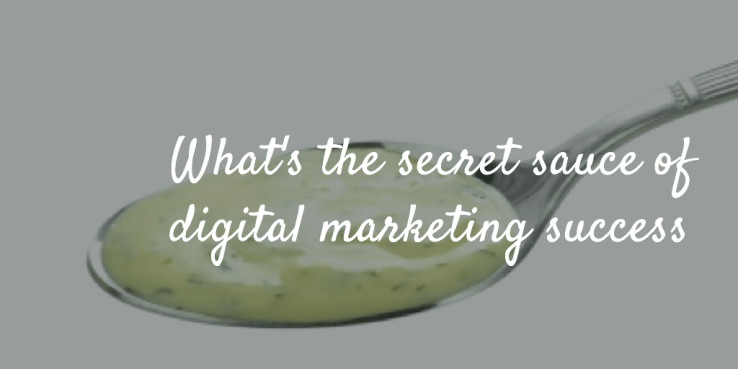 What’s the secret sauce for digital marketing success? I did a podcast interview on Friday — I’ll share the link through my social networks and with my email subscribers once it’s live — and that was one of the questions asked. I was a little flummoxed because, to digital marketers, that’s like asking the secret to life. It’s a big question with lots of different answers from different people. For me, it was easy to come up with 3 things that make up the secret sauce for digital marketing success. Simple, direct, to the point. I guess I could stop here, but Google requires a minimum of 300 words for SEO so I guess I’ll just expand on these 3 things a little bit. Sure, analytics are a cornerstone of digital marketing success, so they go in my secret sauce in big doses. You can’t just use any old analytics to make the secret sauce for digital marketing success. You need the right analytics, the metrics that make a difference in your market performance. You can pitch metrics like fan/ follower counts in the trash because that’s what they are — garbage. Sure, in the old days when organic reach existed on Facebook and Twitter wasn’t a stream whizzing by so fast no one could possibly read it, the number of fans or followers you had made a little bit of difference. Today, the impact of what we call vanity metrics is pretty close to 0. And, don’t just focus on bottom of the funnel metrics — things like sales, leads generated, and email sign ups. Sure, bottom of the funnel metrics tell you how well you’re doing at moving folks all the way down the funnel where the cash register starts ringing, but they’re not very good at showing you what you need to do to get more folks down the conversion funnel. Having too small a number at the bottom of the funnel may be because you didn’t pour enough folks into the top of the funnel — create enough awareness. The solution is to create more awareness by doing some advertising (maybe a little PPC campaign or some Facebook sponsored posts), reaching out to influencers and asking them to share positive things about your brand (I get free stuff like this all the time from folks hoping I’ll mention something about their brand in my blog or on my social networks; trips to Jamaica, front row seats on the 40 yard line at the Redskins games, cool clothes, etc), or maybe creating a contest that encourages customers to share about your brand (through user-generated content, for instance). But if your problem is that your product doesn’t make it past the consideration stage, you have an entirely different problem on your hands. You’re not making it into their consideration set. Now, the solution involves figuring out why folks don’t view your product very favorably. Maybe you’ve had some problems with product quality or maybe your customer service folks just aren’t doing a good job of addressing customer issues, or maybe you’ve really pissed off an influencer who’s bent on damaging your brand. See, once you get past the bottom of the funnel metrics (or, I guess technically before), the questions just seem to multiply. Start your analytics plan by understanding your KPIs. That’s a good starting point. Now, think of all the activities that support your KPI’s and add metrics to assess them to your list. Finally, create goals for each metric, establish a system for collecting and analyzing the metric then getting it to the decision-maker who needs the information — preferably visually. Content marketing is a big part of the secret sauce for digital marketing success. Google made sure of that. In the past, digital marketers played lots of games to get their websites to rank well, bringing with it a wealth of organic traffic from searchers looking for their brands. Searchers For most sites, organic search is still a major traffic source, but Google shut down most of the gamesmanship that went into creating that river. Now, content is king — as it probably always should have been. Content is now the driver determining your ranking on search. How much does ranking impact digital marketing success? 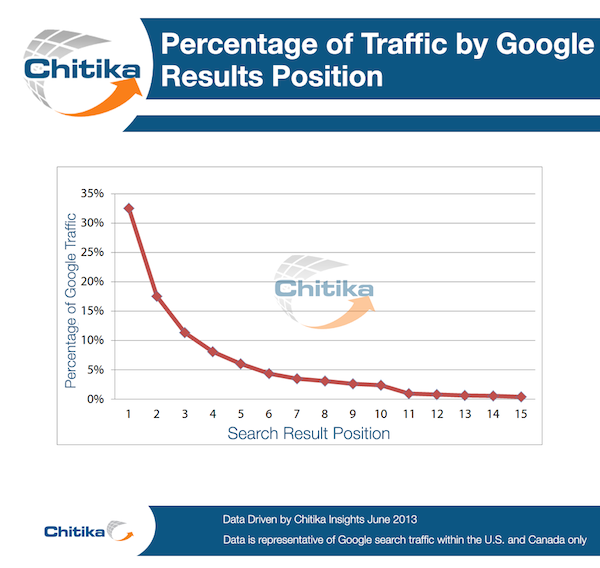 Take a look at this from Chitika, showing that a full third of clicks belong to the site in position 1. Also note that almost all (91+%) of clicks go to links on the first search results page. Producing high-quality consistent content produces digital marketing success by getting you on the first page. But that’s not all. Great content builds your reputation as a trusted provider — which translates into more conversions. Hence, content marketing is both a top of funnel and bottom of funnel strategy. Because content marketing is so important for digital marketing success, add metrics representing content marketing to your analytics plan. You’ll need metrics including which posts perform best, which headlines perform best, demographics related to folks who read posts (to ensure you’re reaching your target demographic — new to Google Analytics), and even the progression from content down the funnel to sales (with Google’s funnel available in Analytics). A/B testing helps create a fuller picture of how content impacts your digital marketing success. It’s not enough to just upload content to already crowded social networks and create more pages on your website. You need to fire up your target audience for digital marketing success. That means engagement. Engagement involves using digital technologies to find, listen, and mobilize a community to support a brand or issue. Notice this definition starts BEFORE you see any consumer actions, so it involves more than getting clicks, likes, shares, follows, etc. Engagement involves creating a community in the first place, then listening and responding to them with content that mobilizes them to promote your brand. Engagement amplifies your message, enabling you to reach many more folks than you might otherwise, but, more important, engagement adds an element of trust to your communications. And, that’s important for digital marketing success. Think about it. You might not rush out to buy that new widget just because you saw a commercial or a post from the company on Twitter. But, when your friend Sally shares the message, you’re much more likely to buy because you know Sally and trust her. You figure she wouldn’t share something if the product wasn’t any good. Even strangers have more ability to promote purchase than brands. Remember the old Blockbuster stores? You’d wander the shelves looking for a movie to rent. Often, someone would walk past, see the titles you were looking at, and recommend something or warn you not to waste time watching a particular movie. And, verbal communication isn’t required. You might order a particular dish or visit a particular restaurant after seeing the food on other diners’ plates. Restaurants with outdoor seating entice dinners with not only the image of delicious food on diners’ plates, but the aromas — we’re hardwired to respond more to visual and olfactory clues, than auditory ones. 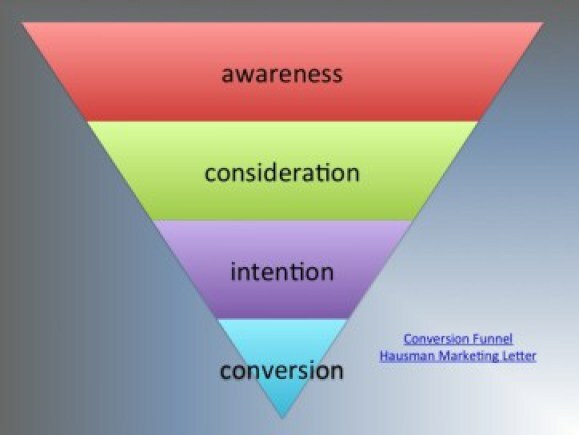 Creating engagement also drives your target audience down the hierarchy of effects — a fancy name for a process driving more folks into your conversion funnel and increasing the chances they’ll move all the way through the funnel to conversion. At its highest level, the hierarchy of effects creates evangelists — in this case evangelists aren’t promoting a particular religious belief, but promoting a brand. Evangelists keep the brand top of mind by mentioning it frequently, but they go well beyond simply sharing information, they encourage others to buy and defend the brand when others say harsh things about it. They craft user-generated content and answer questions to improve the user experience of other consumers. That’s all you need for digital marketing success. Now, you might disagree with me. And that’s fine. Just add it to the comments below. If you think about it, I think you’ll find everything else that makes digital marketing success falls into one of the three buckets: analytics, content marketing, and engagement. Try it.